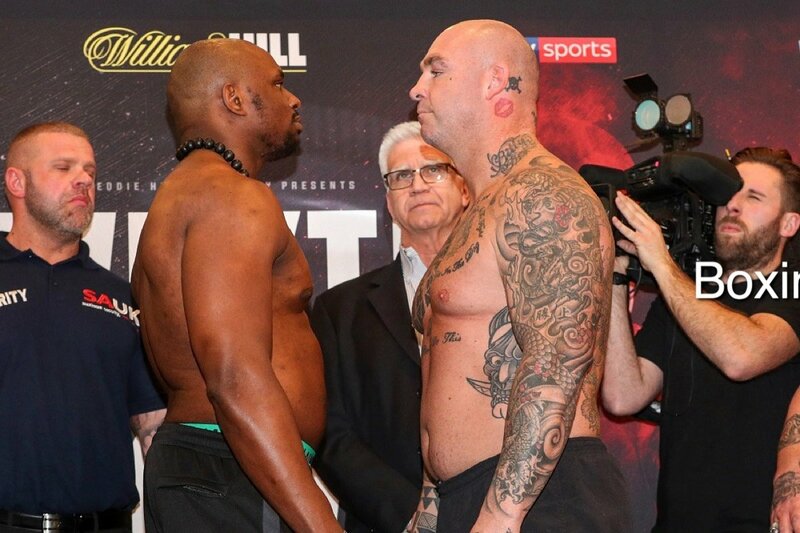 Photo: Ed Mulholland / HBO — The weights are in for tomorrow night’s heavyweight elimination bout between Dillian Whyte and Lucas Browne (and how both big men have indeed tipped-in at a hefty poundage) and the stakes are as high as the weights of the two fighters. A big fight in its own right, with world rankings on the line, tomorrow’s fight at The O2 in London might give us Deontay Wilder’s next title challenger. Wilder, as we know, wants that massive unification showdown with WBA and IBF ruler Anthony Joshua (who, if he beats Joseph Parker next Saturday night, will also hold the WBO crown), but as things are – with Joshua and his promoter Eddie Hearn stating their position very well: namely that unless Wilder “gets realistic in negotiations” this fight will have to wait – fans run the risk of growing highly impatient. Yet it seems Wilder and Joshua can be expected to fight some other contender next, and not each other. And according to Hearn, who spoke with The Telegraph, the winner of tomorrow’s WBC silver title fight rumble will be expected to emerge as Wilder’s mandatory challenger. Over the past months, Wilder has made it clear he has next to no interest in fighting Whyte, yet if Whyte, or Browne, becomes the WBC mandatory challenger, Wilder will have no choice to get the fight on, other than to vacate the green belt (a highly unlikely scenario – the title being Wilder’s main bargaining chip for that unification go with AJ). So, can either Browne or Whyte, both capable yet also controversial fighters (both having failed a drugs test in the past), give the 40-0(39) banger a real go, maybe even defeat Wilder? Wilder showed plenty in the big win over Luis Ortiz earlier this month (the Cuban southpaw being a fighter most would likely pick to defeat either Whyte or Browne) and it’s probable most fans would pick “The Bronze Bomber” and his lethal power to be too much for either man. Whyte and Browne are both quite hittable, but then so is Wilder. In fact, just about any fight Wilder has had/will have figures to be exciting for however long it lasts. Whyte insists he has what it takes to KO Wilder. But who will earn a shot at Deontay, Whyte or Browne? I’m going for Browne to get the win tomorrow, either by late stoppage or by wide decision.